Since December of 2006, San Pedro has held a Holiday Boat Parade each year. 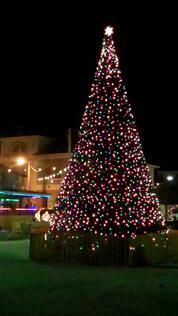 Â This event has now become part of the formal kickoff to the holiday season in San Pedro Town, Ambergris Caye. Â This year it was held on Saturday night, December 3rd. Â The night before The town square Christmas tree came to life as local dignitaries attended the tree lighting ceremony. 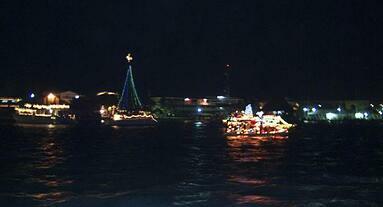 Twelve vessels participated in the boat parade this year. Â The parade started on the north side of town, at the Boca del Rio beach near the bridge. Â The boats headed south for several miles until they reached the turning point at Caribbean Villas. Â Then they returned to the town square. As the boats passed along the shore, hundreds of visitors and San Pedro residents lined the docks and restaurants. There are many perfect perches for viewing the colorful, flashing artistic creations, as they floated by on the tranquil Caribbean Sea. A lively block party was held at the town square after the parade. Everyone could join in the general revelry and activities at the party. Â Party goers enjoyed the food and music while waiting to hear if their favorite team took the grand prize. The last few years weÂve coordinated our December Chill Weekend with the Holiday Boat Parade. On each Chill Weekend we hold one group dinner at the Blue Iguana restaurant, at Grand Baymen. Â ItÂs a perfect venue for watching the brightly attired boats stream by, from the comfort of the restaurant. Dinner started earlier than usual. Â By the time dessert was served, our visitors had two options. Â They could hang out and watch the parade from their comfortable perch at the Blue Iguana. Â Or they could head down to the dock, for a closer view, under the open sky. It did sprinkle the night of the parade. But that didn't stop enthusiastic observers from hanging out on the docks along the shore. Â And this event is always a lot of fun for the crews. Â They sing carols, whoop it up, and immerse themselves in the Christmas spirit. Grand Prize went to the San Pedro AIDS Commission. They had the most enthusiastic and energetic crew. Most Artistic prize went to the Sun Breeze sponsored Marley Jean, with a pirate party theme. Most Religious award went to Holy Cross Anglican SchoolÂs manger scene. Second overall prize went to Sirena Azul, sponsored by the Blue Tang. For more 2011 Christmas Boat Parade pictures, and a related article from Ambergris Today, click here...Â Our cover photo is thanks to Luis Zapata, photographer for Ambergris Today. 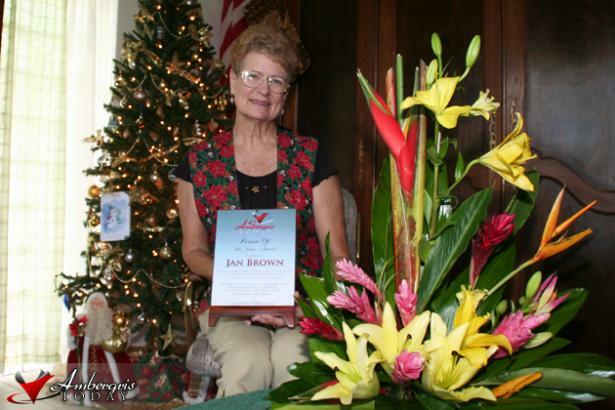 This event was initiated by expat Jan Brown. She is one of the most active volunteers on this island. Â Jan had been involved in a Christmas Boat Parade when she lived in the Clear Lake area of Houston. She saw the opportunity to bring this beloved tradition to Ambergris Caye. Jan headed up a committee and has been actively involved ever since. This committee maintains their independence each year. Â This way, they can work with multiple organizations to make the event a success. Â The Belize Tourism Board has been a big supporter. Sponsorships allow this event to be free to the public, and for the boaters who enter. Â In addition, the local businesses donate popular prizes. This also encourages groups to make the effort to enter the competition and make the effort to decorate their boats.